Why does the piano part seem comparatively simple in contrast to the violin and cello parts, which make the highest demands on the instrumentalists? And why on earth do three musicians play in concert with an orchestra? As interesting as these questions are with regard to Beethoven’s cryptic "Triple Concerto", there is a multitude of ways to approach this exceptional work by the great symphonist. In the gallantry of the expression, and keeping in mind the demand for playable parts for his invited circle of musical connoisseurs, Beethoven developed his very own concertante tonal language. 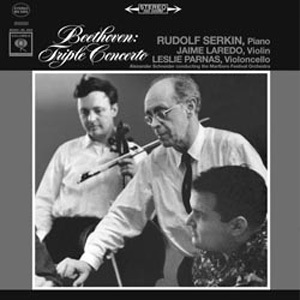 This language is brought to life by Rudolf Serkin (piano), Jaime Laredo (violin) and Leslie Parnas (cello) in that they enter continually newly arranged dialogues and thereby offer the listener a warm palette of colors and melodies. The orchestral antagonists – the Marlboro Festival Orchestra – weaves a chamber music-like, delicate and wonderfully transparent carpet of sound, upon which Beethoven’s characteristic woodwind instruments are bedded like roses. Thanks to these attributes, this recording appears to take place in the luminous glow of a private house and thus conveys a charming yet stimulating atmosphere.